Bloodshot eyed Skipper. I made a meme. Poor Skipper. Wallpaper and background images in the पेंग्विन्स ऑफ मॅडगास्कर club tagged: penguins of madagascar skipper. Lol that is soooo clever! > Who's the prettier than Taylor swift ? 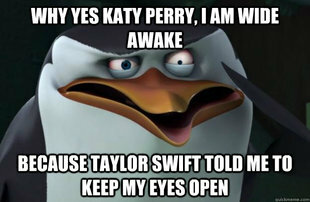 > Kowalski says : " Justin bieber"
As a Taylor Swift fan, I approve! @Skipperahmad I think I find your comment a bit offensive because I'm a Belieber, Fanguin, Directioner, Katy Cat, Swiftie and etc. Lampy said that she's also a Taylor Swift fan. @yasmin : I'm sorry, That's meme's is not mine. 2. if skipper's here, hahahahahahahaha!!! !